Cotton Balls by Carmen Jackson - 8.000" x 6.250"
Cotton Balls framed print by Carmen Jackson. Bring your print to life with hundreds of different frame and mat combinations. Our framed prints are assembled, packaged, and shipped by our expert framing staff and delivered "ready to hang" with pre-attached hanging wire, mounting hooks, and nails. Painted February 2011 - Done for Black History Gallery Display. 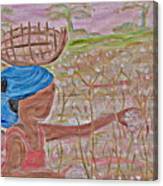 I looked through a lot of pictures to fine the right image that capture the hard labor of picking cotton. 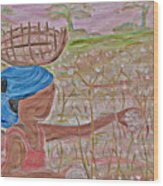 I changed the colors of the background to light pink to reflect the fact that generations of females around the world were largely the workforce that picked the cotton of their slave masters. 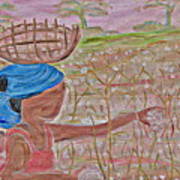 Historically the people who actually benefited from their own hard work picked their own cotton! It's hard to believe that my cotton jeans could have been made with cotton picked by a modern day slave of today! 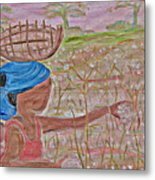 Yes, it is true that slavery still exist around the world in 2011 and it is true it is on the rise especially with human trafficking of women and children but their not being used to pick cotton! In celebration of Black History this is dedicated to those who labored but did not reap a harvest of free trade nor freedom from prostitution labor!